Step inside the StoreSafe Vault, learn how to extend the shelf life of your produce and nevermore will it prematurely rot. 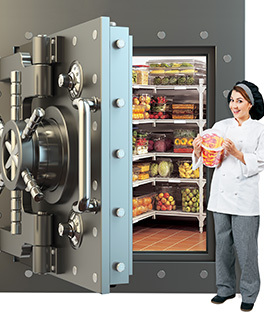 We continue to reinforce our StoreSafe brand and invite foodservice operators to step inside The StoreSafe Vault at the upcoming NRA Show (National Restaurant Association) Booth #3418. While inside the StoreSafe Vault, we will share with operators new ways and tools needed to help them extend the life, quality and safety of their produce. We offer storage products that have been proven to extend shelf life by up to three days! This amounts to more days of usable produce, less frequency in deliveries, controlled food costs, improved inventory management and more importantly, less food waste. This is our way of helping operators learn proven methods that will allow help them gain a better understanding of proper food storage practices. We are also extending a great opportunity for all foodservice operators: The chance to win a $2,500 Storage Upgrade! Two ways to win! Two lucky winners will receive a wide variety of Food Pans, Square and Round Food Storage Containers with Seal Covers to help them extend the life, quality and freshness of their produce. Enter online at cambro.com/TheVault. Operators will be asked to share how a storage upgrade from Cambro would help them Lock in Freshness and Lock out Risk. Contest will run from May 16, 2015 through June 16, 2015 and is open to all foodservice operators in North America. For more information regarding StoreSafe visit www.cambro.com/StoreSafe. I hope the Show has been good.